Wireless systems for industry have mostly used cellular-phone-style radio links, using point-to-point or point-to-multipoint transmission. But research at MIT's Media Lab in Cambridge, MA, indicated that traditional wireless formats have liabilities in industrial applications. These include rigid structure, meticulous planning requirements, and dropped signals. In contrast, wireless mesh networks are multihop systems in which devices assist each other in transmitting packets through the network, especially in adverse conditions. You can drop these ad hoc networks into place with minimal preparation, and they provide a reliable, flexible system that can be extended to thousands of devices. The wireless mesh network topology developed at MIT for industrial control and sensing is a point-to-point-to-point, or peer-to-peer, system called an ad hoc, multihop network. A node can send and receive messages, and in a mesh network, a node also functions as a router and can relay messages for its neighbors. Through the relaying process, a packet of wireless data will find its way to its destination, passing through intermediate nodes with reliable communication links (see Figure 1). Figure 1. In a wireless mesh network, multiple nodes cooperate to relay a message to its destination. The mesh topology enhances the overall reliability of the network, which is particularly important when operating in harsh industrial environments. A network shouldn't need a system administrator to tell it how to get a message to its destination. A mesh network is self-organizing and doesn't require manual configuration. Because of this, adding new gear or relocating existing gear is as simple as plugging it in and turning it on. The network discovers the new node and automatically incorporates it into the existing system. A mesh network is not only inherently reliable, it's also highly adaptable. If your tank-level sensor and data logger are placed too far apart for a solid RF communications link, you just add one or more repeater nodes to fill the gaps in the network. On the Internet, if one router goes down, messages are sent through an alternate path by other routers. Similarly, if a device or its link in a mesh network fails, messages are sent around it via other devices. Loss of one or more nodes doesn't necessarily affect the network's operation. A mesh network is self-healing because human intervention is not necessary for re-routing of messages. The meaning of "redundancy" in the real world is a matter of degree and must be carefully specified. In a mesh network, the degree of redundancy is essentially a function of node density. A network can be deliberately over-designed for reliability simply by adding extra nodes, so each device has two or more paths for sending data. This is a simpler way of obtaining redundancy than is possible in most other types of systems. A mesh network is also scalable and can handle hundreds or thousands of nodes. Because the network's operation doesn't depend on a central control point, adding multiple data collection points or gateways is convenient. Reliability, adaptability, and scalability are the most important attributes of a wireless network for industrial control and sensing applications. Point-to-point networks can provide reliability, but they don't scale to handle more than one pair of end points. Point-to-multipoint networks can handle more end points, but their reliability is determined by the placement of the access point and end points. If environmental conditions result in poor reliability, it's difficult or impossible to adapt a point-to-multipoint network to increase reliability. By contrast, mesh networks are inherently reliable, adapt easily to environmental or architectural constraints, and can scale to handle thousands of end points (see Figure 2). One opportunity for mesh networks is in distributed control systems. There's been a trend in recent years to place more intelligence throughout the control system. The IEEE 1451 standard Smart Transducer Interface for Sensors and Actuators is evidence of this. Distributed intelligence is naturally served by wireless multihop mesh networks. The control of the wireless system is distributed throughout the network, allowing intelligent peers to communicate directly with other points on the network without having to be routed through a central control point. Proponents insist that modular control systems are easier and less costly to maintain. The rationale is that modular control systems enable localized decision making, which isolates problems in the system faster. The problems can usually be diagnosed back to a single instrument cluster, allowing engineers and maintenance staff to focus their attention on one area of the system. Fast problem solving means less downtime when something goes wrong. Likewise, when the system is operational, local decision making by intelligent instruments and small PLCs identifies problems before they impact the entire system and cause bigger problems. Finally, modular subsystems can be replaced or upgraded without affecting the entire system. These factors make systems much cheaper and easier to operate and maintain. Matching multihop, wireless mesh communications with distributed control facilitates a whole new dimension of interactions between sensors or sensor clusters. Sensors can now communicate directly with other devices on the network. This topology allows a ýank-level sensor to communicate directly with nearby valves, alerting them to open or close to prevent an overflow. Monitoring equipment can take readings from sensors without having to directly access them via wired connections. This is useful in calibration and troubleshooting. Figure 3. Mesh Networks can provide a low-cost diagnostic channel outside of normal control loops. This enables significant productivity improvements where manual measurements may have previously been required. By regularly capturing diagnostic data, plants can use predictive maintenance to reap additional cost savings. Another application for wireless, multi-hop, mesh networks is in the diagnostic monitoring of devices. This monitoring can occur outside the normal control loop, and wireless communications notify the system user of any abnormal operation of the device (see Figure 3). In this control loop, an additional signal is extracted and analyzed during normal operation of the sensor. The signal is monitored for abnormalities without affecting the sensor's operation. If an abnormal signal or trend is observed, an alert is triggered. The beauty of using a wireless link for onboard monitoring and notification is that the link is independent of the control loop. By using a wireless, multihop mesh network, data can be routed dynamically to similar wireless devices. Surrounding devices can respond to an alert from a failing device, even as maintenance personnel are being notified. Another benefit of wireless is that maintenance personnel can directly access the diagnostic output of the sensor without running wires. This can eliminate a huge task in the case of a tank-level sensor in a large storage tank, or a temperature probe at the top of a stack at a chemical refinery. In a wireless, multihop mesh network, a user can get that data via any wireless node on the network. By using a diagnostic device with additional processing power (e.g., a laptop computer, handheld computer, handheld diagnostic device), maintenance personnel can check on configuration and other information about a node on the network. This information is a valuable tool for checking and verifying sensor operation when questionable data are received from a sensor through its primary control loop. Daily experience with the challenges of wireless consumer products, university research, and industry's slow adoption of wireless for use in enterprise applications are indicators that products based on point-to-point and point-to-multipoint topologies may not be well suited for industrial enterprise communications. Multihop mesh technology, however, is inherently reliable and redundant, and it can be extended to include thousands of devices. In addition, these networks can be installed in hours instead of days or weeks. And the network doesn't require sophisticated planning and site mapping to achieve reliable communications. There's no need for specialized and costly RF engineering labor to complete the installation. The network is self-configuring. All devices can transmit from their original position, and they don't have to be moved. A weak signal or dead zone can be fixed simply by dropping a repeater node into place. The network error rate is low and can be further reduced if occasional re-transmits are allowed. Industrial systems can now benefit from a wireless format that satisfies the multiple conflicting demands of redundancy, distributed communications, flexibility, and reliability. Furthermore, self-configuring, self-healing networks are inherently less expensive to install and maintain as radios and microprocessors become cheaper. A significant barrier to low-cost connectivity has been removed. This article was adapted from the technical white paper titled "Reliable Wireless Networks for Industrial Systems," published by Ember Corp. Used by permission. Point-to-Point Links. Sometimes referred to as a wireless bridge, a point-to-point link replaces a single communications cable. A point-to-point link might be used to connect a PLC to a remote monitoring station. Point-to-point links can communicate reliably as long as the two end points are close enough to one another to escape the effects of RF interference and path loss. If you can't achieve a reliable connection initially, sometimes you can relocate the radios or boost the transmit power to achieve the desired reliability. Point-to-Multipoint Links. These wireless systems (e.g., IEEE 802.11 or Bluetooth) have one base station, or access point, that controls communications with all of the other wireless nodes in the network. Also referred to as a hub-and-spoke or star topology, this architecture is similar to wired "home-run" systems, in which all of the signals converge on one terminal block. Signals in point-to-multipoint networks converge at a single access point. The reliability of these networks is set by the quality of the RF link between the central access point and the end points. In industrial settings, it can be hard to find a location for an access point that provides dependable communications with each end point. Moving an access point to improve communications with one end point will often degrade communications with other end points. Although you can wire together multiple access points to improve reliability, the cost of additional wiring can defeat the original reasons for choosing a wireless solution. Figure 4. A water treatment plant poses many challenges to conventional wireless networks, including reinforced concrete walls, large steel tanks, and water. With a mesh architecture, the network can route traffic around interference posed by these obstacles. To validate wireless mesh networks in challenging industrial environments, Ember Corp. deployed a system in a water treatment plant. 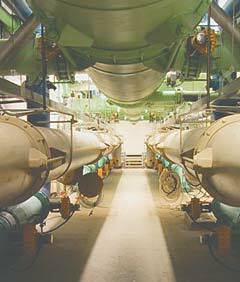 The environment was typical of such facilities, with significant wireless environmental hurdles, such as thick reinforced concrete walls segmenting giant tanks of water, with many metal pipes running between tanks (see Figure 4). The goal was to connect the instruments in the pipe gallery back to the control panel located in the control room. A look at Figure 5 provides a geographical representation of the instrumentation topology. Figure 5 shows the approximate locations of eight instruments in the large pipe gallery, along with four instruments in the small pipe gallery. The control room was located on the third floor of an attached concrete building. Before wireless communications, a data collection PC in the control room communicated with process instruments over a RS-485 serial bus. The first step in converting this system to wireless networking was to replace this computer's bus connection with a wireless networking card connected to its serial port. Each process instrument also had bus connections replaced with wireless networking cards, which self-configured on power-up and began attempting to send data to the control room. After all 12 instruments had wireless cards installed, you could analyze the RF network traffic and determine where link reliability was below standards. These areas included spots where RF signals had to pass through reinforced concrete walls and where a single link spanned two flights of metal stairs. The technicians were able to improve the RF links simply by adding relay points. And they could do this because they didn't have to work through a central control point and each node could cooperatively relay packets on behalf of its neighbors. After the technicians placed the repeater nodes, the network was complete. Figure 5. Shown above is a wireless mesh network that was deployed in a water treatment plant. This implementation includes repeaters that enhance reliability. Technicians installed the new network in <2 hr. ?compared with ~20 hr., when each instrument had to be wired back to the control panel. The software on the PC didn't discern any difference between the wireless communications network and the wired serial cable network. The wireless network exhibited <0.1% packet loss before any attempt was made to re-send lost packets through the network. This was accomplished via the mesh networking algorithms used by the wireless network. Neighboring nodes cooperatively relay packets over the best RF link.